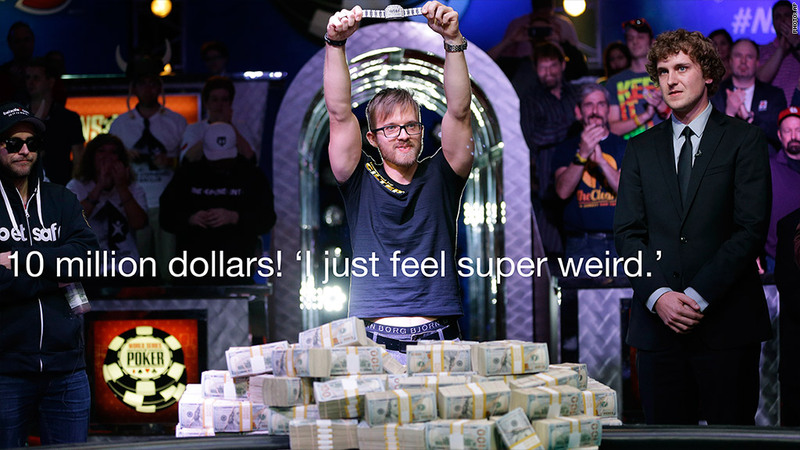 Swedish poker pro Martin Jacobson said he was more interested in the title of world champion than the money. He got both -- taking first place in the World Series of Poker and the $10 million payout. It was a big comeback for the 27 year old. In July, more than 6,700 players paid $10,000 to enter the tournament in Las Vegas. They got down to nine players and then came back this week to finish up. When they returned, Jacobson was way behind, but stayed disciplined and steadily moved up to take the lead. Early Wednesday morning he knocked out the remaining player. "I think I'm in shock," he said. "I'm not really feeling anything. I just feel super weird."